Have you bought a sleeping bag that you thought was good only to spend an incredibly uncomfortable night in it? When most people consider the criteria for high quality, comfortable sleeping bags, they think of the fluffiest, most insulated option. These factors are undoubtedly significant. What is just as important, however, is the fit of your sleeping bag. Or, to be more precise, just how snug a sleeping bag is when you are all zipped up. The main question is how to find the right sleeping that fits you well lengthwise. Since you are looking for a snug fit, you might imagine that you should choose one that is the same as your height. This means that if you are 6 feet tall, your sleeping bag should measure the same. This, however, is just a little too snug. After all, you are going to need to some room to move around, at least a little. Therefore, you should look for sleeping bags that are several inches longer than you are. One of the problems typically associated with the sleeping bag lengths is that they tend to be quite generic. For men, the most common heights that are catered to are between 6 feet and 6.5 feet. This means that if you are taller or shorter than this, you are in a bit of trouble. Fortunately, there are some brands such as ALPS Mountaineering that are perfect for those that don’t fall into this range. Their Crescent Lake series is perfect for shorter individuals as their “Short” is good for those around 5’8 or so. Also, their “Long” goes all the way up to 7.2 feet. If shorter men really are having trouble with finding the right fit, they can turn to the women’s options. Regular Dimensions: 32x80", Weight: 5.25 lbs. Women’s lengths tend to be shorter, to fit the average woman. This fits most women between 5’4 and 5’10, although some variations due exist between manufacturers. Women who are taller than usual may find some options with unisex bags. Conversely, some petite women could potentially fit into to children’s sleeping bags. Measuring alone is not enough to find the right sleeping bag. You are going to need to get into the bag that you are looking at and zip yourself up. So, how do you know when it’s fitting you just right? Pay attention to where your toes end. There should be a little bit of space between your toes and the bottom of the sleeping bag. This space shouldn’t be too little or too much. If your feet are pushed against the bag, this means that it is too small for you and this brings its own set of issues including discomfort. For the longest time, women and men slept in similar sleeping bags. These proved to be less comfortable for women, and in particular, a lot colder too. Now, women tend to feel colder than men and as such require greater insulation. This is also precisely the reason why overly long or big sleeping bags are simply not efficient enough. Therefore, to accommodate women, the female-specific bags tend to be shorter. This is not the only difference, however. These type of sleeping bags have also been structured to women’s bodies better. Women are usually narrower in the shoulder but wider around the hips. 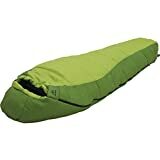 The Sierra Co-op Joule 21 and the Marmot Angel Fire are the best examples of these type of sleeping bags. Of course, as mentioned above there may be some instances when women may have to resort to using unisex or men’s bags. Also, men who have smaller builds may find that the best options for them are available in the women’s lines. A great unisex option is the Dorado Duo HD which ticks all of the right boxes for both men and women. 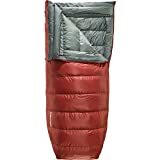 The four most common shapes of sleeping bags are the mummy sleeping bag, the rectangle bag, the tapered/semi-rectangle bag, and the double wide. A mummy sleeping bag may sound quite disconcerting but these type of sleeping bags are meant for really cold weather. This is because it is the widest at the shoulders and then decreases in width until your feet where it is the least wide. Since there is not much room for air to exist, it is the warmest option. The rectangle is probably what you are most used to seeing. Unlike the mummy sleeping bag, this one is meant for warm weather as it allows for plenty of air space inside the bag. Then, there is the tapered/semi-rectangle. This is basically a mix between the mummy and the rectangle. It provides more warmth than the rectangle but offers greater warmth than the mummy. The double wide is the option for two people who want to share the same sleeping bag. One of the best, most comfy models available so far is the Sierra Designs Backcountry Bed Duo. 600-fill DriDown insulation stays dry 10-times longer than untreated down and dries 30% faster. Zipperless design means no hardware, cords or Velcro to get in the way of your comfort. Catenary shaped opening is smaller than the bag width, so when you push out, the walls push in to seal out drafts. Versatile integrated comforter wraps naturally to your preferred sleeping position and allows for easy adjustment to varying temperatures. Insulated hand/arm pockets provide insulation under your arms when comforter is used outside the bag. When deciding on the right shaped sleeping bag, you need to be honest about what kind of sleeper you are. For instance, although you may need warmth, if you are a bit of restless sleeper, a mummy sleeping bag is going to make you feel suffocated. A semi-rectangle will probably be more up your street. This is why you will need to prioritize what your main requirements are before selecting a shape. To determine which option may be best for you, you will need to measure the width of your body. You will have to do so at your shoulders and then repeat this for your hips. Men’s sleeping bags can fluctuate a great deal when it comes to shoulder measurements. Bag shoulder widths can run the gamut from 58 inches to 66 inches. It is more likely to see those between the range of 60 and 64 inches, nonetheless. This is to accommodate the fact that most men tend to have broad shoulders. However, sleeping bags for men are narrower around the hips. The most typical measurements you will get here is around 58 inches or so. This is opposite for women. The shoulders tend to be narrower at the shoulders – between 56 and 60 inches. Around the hips, these same bags will tend to measure around 60 inches. As with the height, you should avoid a fit that is too large or too small. There should be a couple of inches difference between the width of the bag and the width of your body. This gives you at least some wiggle room and will make the whole experience less stuffy. A common component that is overlooked is the hood of your sleeping bag. The fit of this feature also matters to your overall sleeping experience. You can apply the same rules to the hood as with the height and the width – find something that is neither tight nor overly loose. Here, measuring your head is not going to be of much use so placing your head inside the hood is what is required. The hood should wrap comfortably around your head. At the same time, it should make allowances for movement. In particular, you should be able to move your head left and right and have plenty of room to be able to do so. A recurring throughout this article and in fact, when it comes to choosing sleeping bags shapes and sizes is temperature. Temperature is the greatest reason for why you are even paying attention to sleeping bag sizes. In particular, colder temperatures is why you want a sleeping bag that fits perfectly. Whenever there is space is present within a sleeping bag, this empty space is occupied by air molecules. In order for your bag to feel nice and toasty, your body heat is going to have to warm up that surrounding space and molecules. Therefore, the more space available, the greater the number of molecules and the more time it takes to heat up. This is why snug sleeping bags make sense in cooler climes. So, what about when it is warm out? Do you still need a sleeping bag that fits well? As we have already discussed, rectangle shaped, looser bags are better in the summer time or warmer climates. The outside temperature is not the only thing that you should take into consideration, nonetheless. Take a moment to think about your own reaction to the cold or the heat. Some people just feel cold or warm, regardless of what the surrounding temperature is. If you are someone who feels cold most of the time, a tighter sleeping bag may be better for you, perhaps a mummy sleeping bag. Conversely, if you tend to exude a great deal of body heat, then you may require greater air space inside of the sleeping bag, much like a semi-rectangle bag. If you do want to buy a large sleeping bag, there is one more thing to think about. This is the size that it will roll up to. Typically, the bigger the bag is, the greater the size of the pack that you will need to carry. Not to mention, these type of bags tend to be heavier as well. Now, this is only really important if you are going hiking. If you are using a vehicle to get to your destination and will not need to carry the bags for long, you have more options to choose from. If you are planning on hiking, even a little, with your sleeping bag, you should consider the size and the weight. Few people use their sleeping bag as is. If you want to get comfortable, you are typically going to accessorize your bag. Most people use pillows or cushions, sleeping pads, blankets, and even liners. If you are planning on using one or more of these items, it does change your shopping requirements just a little. After all, you are going to need a sleeping bag that is able to fit some of these accessories in it. The solution isn’t to always just get a larger bag, however. Instead, you should look at just how much a particular bag can stretch to accommodate what you do want to put in it. If you are shopping online, you will have to resort to comparing measurements between the bags and the accessories. Don’t forget to factor in your own measurements as well to make sure that you fit. The best way to get the right fit is to see exactly how a sleeping pad or a liner would fit inside your bag. Once it has been fitted, you should get in as well and look at how much room there is for you. The same conditions apply and you need to make sure that there is an adequate amount of space for you. This is what you should look at when trying to find a sleeping bag that fits you well. As much as you might want to, it can be difficult to find a bag that fits all camping occasions. For the best and most comfortable fit, you may want to think about getting two or more bags. It is important to test out any of the sleeping bags that you do want to buy before committing to them.